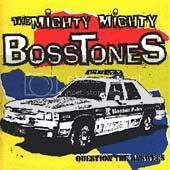 One of my favorite albums of all times is The Mighty Mighty BossTones Question The Answers. And while none of the songs are overly deep, the title really stuck with me for a long time. You are probably wondering why on Earth I am bringing up The Mighty Mighty BossTones when I'm supposed to be writing about soccer. Well, every Rhino fan's favorite Democrat & Chronicle reporter, Joseph Spector, had a front page piece on PaeTec Park this past Sunday entitled "Questions loom over stadium funding". And while most would expect that I'd start a rant right about here about the overall negativity of Joseph Spector's coverage of PaeTec Park in general and this article in particular. But, I think I'm going to go in a slightly different direction. Don't get me wrong. I didn't have a great warm and fuzzy feeling after reading the article. But, given Joseph Spector's track record with regards to his coverage of PaeTec Park, my expectations weren't that high as soon as I read who wrote the article. But, I'm a person that has been known to take the Devil's Advocate approach to a conversation on more than one occasion. And I really feel like this was a squandered opportunity to try and answer some questions and question some answers as opposed to just beating on the same old drum. With recent announcements of a total of $12 million in additional funding coming from New York State, it would appear to be the perfect time to ask some new questions about the PaeTec Park project if you want to play the Devil's Advocate role. For instance, LeChase Construction was chosen largely due to getting projects done "on time and on, or under, budget". Well, is that the case with PaeTec Park now that it appears that at least a portion of the additional funding will go towards items such as a video scoreboard? You could also ask about what can realistically be completed by opening day on June 3rd and how much will still be under construction during the first year of PaeTec Park. The much debated question about a choice of playing surface might be another area to question. For instance, stadiums that already have FieldTurf as their playing surface are getting more and more seasons of play under their belt. Perhaps questions can be asked about how those surfaces are holding up versus the promises that were made by the vender. For instance, Giants Stadium has a FieldTurf playing surface. And one of the big marketing moves that new MLS owners Red Bull have done is to pay a lot of money to bring in natural grass for at least the New York Red Bulls home opener this weekend versus the New England Revolution. Another way to go could have been to question the answers that have been given on a couple of topics. Mr. Spector liked to compare PaeTec Park to Frontier Field and the Fast Ferry. Well, one thing that happened with the Fast Ferry project was that a very poor job was done with regards to making the initial business case projections. Perhaps more time could have been spent questioning the projections for PaeTec Park? Will they really get 65 events at PaeTec Park in 2007? Will the average attendance really be close to 10,000 people per event? Personally, the 65 events number looks a lot more achievable than the average attendance of close to 10,000. Perhaps if the Rhinos are playing in MLS in 2007 and they sell out every match, then that could happen. And that brings me to another answer to question. The obvious question to me that wasn't pressed too hard in the article was about a possible move to MLS that has been talked about a lot when the Rhinos were going after state funding for the project. A question that could have been asked, and perhaps should have been asked, is how likely is it that the Rhinos will make the move to MLS? Montreal Impact owner Joey Saputo was asked about whether he was considering moving the Impact to MLS on the heels of announcements that Toronto was joining MLS in 2007 and the Impact were building their own soccer specific stadium in Montreal. Saputo's answer was basically "Why would I move to MLS and lose money when I can stay in the USL and make money?" It would seem to me that that would be a question that the Rhinos would have to be asking themselves. MLS Commissioner Don Garber has recently stated that any potential move to MLS by the Rhinos is entirely in the laps of Rhinos ownership. And while not specifically stated, he hinted about the financial commitment that the Rhinos would have to choose to make to move to MLS. For my $1.50, that is the question that I wish Joseph Spector has chosen to take on in his article this past Sunday. The question of whether the City of Rochester or County of Monroe will be subsidizing PaeTec Park sometime in the near or distant future isn't a new question. It is also one that won't be answered any time soon. But, questions about a move to MLS would have been a new path for Mr. Spector to take on his reporting on PaeTec Park. And that is a question that would have left me feeling like I had learned something new if he were able to get some good quotes out of people in MLS like Don Garber or Lamar Hunt. Other answers to question would be things like ad and sponsorship revenues that the team said that they would get with their own stadium. Everyone knows that the Rochester economy isn't exactly booming. So, have the Rhinos been able to get the types of revenues from things like permanent signage that they expected? That would also be something new to go after that we haven't heard before. Personally, I think that the way things have changed over the years with regards to PaeTec Park, while not the greatest for soccer fans in the region, will be for the best for the team and local taxpayers. The City of Rochester and County of Monroe have contributed nothing to the project outside of neighborhood improvements that were planned to occur with or without PaeTec Park. There are also no bonds that the City or County are responsible for with regards to PaeTec Park. Construction bonds underwritten by the City and the County are why facilities such as Frontier Field and the Blue Cross/Blue Shield Arena at the Rochester War Memorial continue to be drains on local taxpayers. Add in that it's about time that the Rochester area gets New York State to provide the lion's share of funding for a project like this, and I think it's a winning proposal. And it's a much more stable proposal than the original plan with only a minor amount of financing (reportedly $6 million) taking place to complete the project. With the Rhinos having a decade long track record of success drawing large crowds to a less than ideal facility, I can't understand why anyone would project doom and gloom for PaeTec Park over the next 10 to 15 years.